I love that it's holiday card making season. Holiday cards are hands down my favorite kind of cards to make. I combined a classic green and red color combo with two kinds of gray, pulling the gray tones from the woodgrain background in the card base. I was working off the new sketch from RetroSketches. I stamped the Colonial White Panel with images from Woodland Wishes in Fern, Ruby, and Slate. 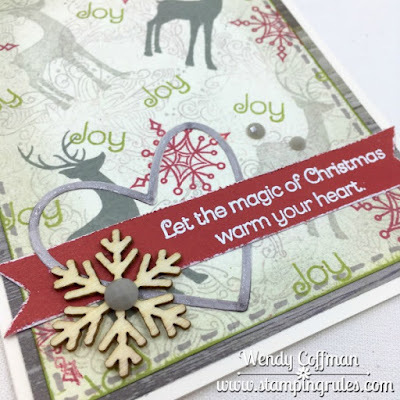 Then I stamped over the images using the star from the October SOTM using Whisper ink to fill in the background with swirly goodness. I embossed the SOTM sentiment in white onto a Ruby banner, which I threaded through a Thin Cut heart. I topped off my banner with a wooden snowflake accented with some gray enamel gems. I couldn't resist a little hand drawn stitch line around the card base to frame the stamped print. Ho, Ho, Hope this project warmed your heart!